I do love the Cheese, Please! Challenge. The first month was perhaps a tad underwhelming, with only myself and one other person submitting recipes (and I seem to remember allowing them to cheat). Since then, more than fifty bloggers have submitted their lovely recipes in reward for nothing more than sharing them with others and the occasional tweet from me. But this month, I’m excited to announce that there’s a prize, woo-hoo! One lucky cheesy cook will win one of artisan cheese-maker Godminster’s lovely new gift sets called ‘Heart to Heart’ – what better cheesy Valentine’s gift? 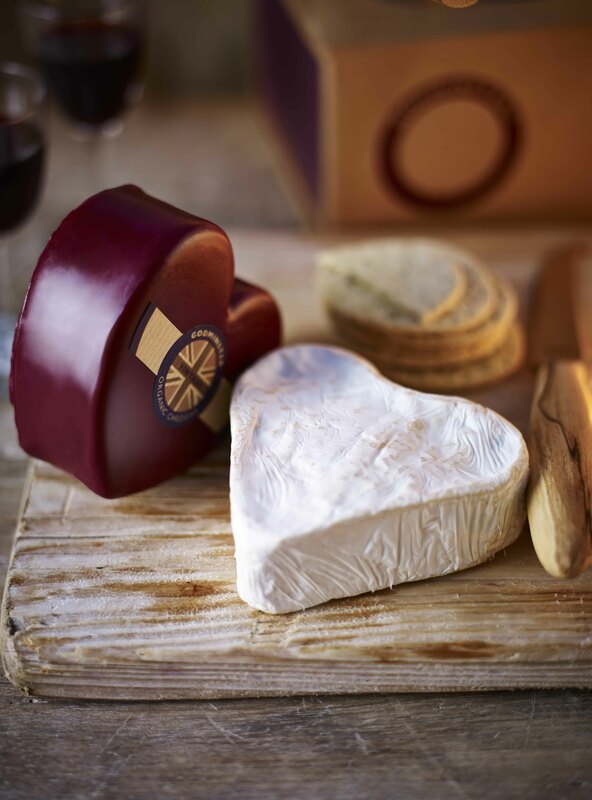 Godminster Farm use organic milk from their own Somerset herd to produce a range of cheeses and this gift set pairs their famous burgundy heart-shaped Vintage Organic Cheddar (made with a 70-year-old recipe and matured for 12-14 months) with a new product, their Organic Heart Brie. And to stand a chance of snaffling it, all you have to do is share a blog recipe under the theme ‘Cheesy Romance’. Of course, romantic food means different things to different people. For some, it’s nothing less than the full works: red roses, champagne and a trip up the Oxo Tower (well, probably The Shard these days…) For others, it’s sharing a bag of hot, salty chips under canvas whilst the rain lashes down outside. For a former flat-mate of my sister’s, it involved making a raspberry jelly in the shape of genitalia and covering it in squirty cream. So interpret ‘romantic’ how you will. It could be that the ingredients spell romance (cheese and oysters anyone? ), the presentation gets all Marvin Gaye on us (steady on, no jelly and certainly no cheese-flavoured body paint), or perhaps there’s a story behind a particular cheesy dish that will warm our cockles (although bear in mind that saying, ‘I’m submitting a cheeseburger recipe because I once got off with someone on a nightbus that I’d just met in McDonald’s’ is unlikely to make a judge feel warm and fuzzy). Recipes can be sweet or savoury, snacks or meals, starters or puds, as long as they contain the vital ingredients of CHEESE and LURVE. 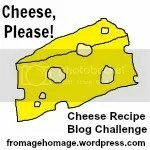 Want to take part in February’s Cheese, Please! Recipe Blog Challenge? The usual rules apply which can be found here. Write a recipe post under the theme ‘Cheesy Romance’ and post it on your blog or website. To be eligible for the competition, recipes must be submitted by midnight on February 26th 2014. The winner will be announced on February 27th 2014. The winner must send their address details to me to pass on to Godminster so that they can post your prize; we promise not to keep them or do anything sinister with them. There will only be one winner. Judge’s decision is final. A link to this post and the Cheese, Please! button (code below) should be included in your post. You can also tweet the link to me @fromhomage or email it to fromagehomage@yahoo.co.uk then I will pick it up and post a link on this page. *Adopts Barry White voice* Show me your cheesy love! FAB theme! And a great prize. May have to go all cheesily romantic on myself to join in! Glad you like the sound of it 🙂 And yes, it’s a lovely prize. I’ve tried their cheese and it’s delicious. Do you accept goats cheese recipes? Okay, thank you ☺️ I need to see if I can do it all correctly now!! Have you ever tried camel cheese….?? Not cheese, no, but I did try the milk once. It was…um…interesting. A bit on the ‘musky’ side. Don’t forget you have most of February to think of something 🙂 No hurry. You are still welcome to share any recipes if you would like to, just like last month. It’s just that they wouldn’t be eligible for the cheese this time sadly. Glad to hear that non-UK mainland bloggers can still share recipes, even though we’re not eligible for the competition (I agree that cheese that’s been shipped too far goes a bit funky…it might be more like a punishment than a prize at that point!). Love this month’s theme, by the way! Glad you enjoy them – and hope you can come up with some cheesy lurve this month! I don’t think I can do donkey or camel cheese, but I already have ideas…. First I thought ‘mozzarella, tomato, and basil’ – so simple but so good. Then I thought why not add it to bread – but then that’s a margherita pizza. Too simple for a competition, surely? So finally I thought of cauliflower cheese! Simple, yes – but tasty? Hell yeah! And what could be more romantic than sharing comfort foods in the winter months? Do you think you could stretch to ireland? Pretty please! I know this sounds dumb but how do I submit an entry? I haven’t done it before? Don’t worry – it’s easy. Just write the relevant blog post (e.g. featuring a cheesy romantic recipe) and then copy and paste the badge info into your post, saying that you’re linking up. That will automatically link it to me so I will see it. Or, if you can’t make that work, just put a link to this page and I’ll find it (or tweet it if you do Twitter). That’s it really! Does that make sense? Every month I vow I will enter this challenge and every month I’ve failed. Let’s see if I make it this time! I did think of you as this month has the opportunity for chocolate written all over it, unlike some previous months.